UNU-MERIT » Bystanders for seven years – is the UN ready for a peacekeeping mission in Syria? Seven years into the war, Syria has seen over 400,000 casualties and more than 5 million refugees. Those still in the country suffer from chemical attacks and brutalities from all belligerent actors, with no end in sight. The question after so many years of bloodshed: isn’t it time for the UN to step in? The political answer – coming from Moscow – is a resounding ‘No’, which would likely be echoed by the other permanent members of the Security Council (P5), albeit for different reasons. The practical answer might well have to be ‘there is no alternative’. Therefore, we must discuss how this arguably most difficult endeavour in the history of the Department of Peacekeeping Operations (DPKO) could be a success. On 7 December 2017, the UN Peacekeeping Mission in the Democratic Republic of the Congo (MONUSCO), experienced the worst attack on UN forces in 24 years, killing 15 peacekeepers and wounding 53. This act of violence was not an isolated incident but just the latest example of the increased hostility ‘Blue Helmets’ face. Over the past few months, many of the UN’s 15 Peacekeeping missions have taken a turn for the worse. Peacekeepers are deployed in hostile terrains where they face asymmetrical threats from rebel groups and terrorist organisations. 2017 was a very tough year for peacekeeping, not only in terms of casualties but also due to political challenges, such as the politicisation of troop contributions, the reluctance of host countries to cooperate with the missions and the national interests of the Security Council members. This is a dangerous trend. First, major Troop Contributing Countries (TCCs) are likely to become even more risk-averse and impose greater limits, or ‘caveats’, to what their troops may do during deployment. These caveats hinder the ability of field commanders to make tactical decisions and thus jeopardise the success of mandates. Second, this trend can also be politicised by the UN’s critics who may call for even bigger budget cuts to DPKO by virtue of its ‘ineffectiveness’. Third, the increase in violence Peacekeepers are involved in –either because they were mandated to or because they were attacked– evaporates the notion that peacekeepers are neutral, putting troops and civilian staff in danger. Despite these conditions, it is important to see what DPKO could learn from its existing operations for a mandate in Syria. Such a peacekeeping mission would require three main components: A hybrid setup, a mandate to fight against terrorism and a strong political strategy. First, any such peacekeeping operation would necessarily have to be co-administered with a regional organisation, i.e. have a hybrid mandate. This wouldn’t be the first of its kind, together with the African Union (AU), DPKO currently runs a mission in Darfur (UNAMID). The results, so far, have been mixed, but having the AU as an equal partner gave the mission considerable political capital within the region, streamlined contributions from African countries and helped smooth the political dialogue as it was not seen as a ‘Western’ intervention. The mission needs to not only have the blessing of the region but long-term commitment to provide troops, equipment and political support. In addition, Western countries ought to support the mission in different ways, including logistical coordination, equipment and intelligence capabilities. As this support will not translate into many troops, more pressure will be on the Arab League to step up their commitment. Even with a brokered ceasefire, the mission would deploy in a hostile region and therefore the mandate must allow troops to actively engage terrorist organisations. Deploying stabilisation missions into active conflict and hostile territories with broader and more robust mandates represented a drastic shift in peacekeeping. One of the strongest examples of this new area of peacekeeping is the United Nations Multidimensional Integrated Stabilisation Mission Mali (MINUSMA), which had been deployed in an active conflict, in the midst of multiple terrorist organisations, with a mandate that could be considered a counter-insurgency operation. MINUSMA has been one of the deadliest missions in UN history and observers expressed doubt that 2018 will be a more peaceful year. Much of the complex security environment in Mali, and the failures to address it can be lessons learned for a potential mandate in Syria. The Syrian context is incredibly complex, involving a plethora of actors. Already there is a fundamental disagreement among the P5 on which actors should be considered terrorist organisations, which as could be seen in Mali can jeopardise peacebuilding in the long-term. The hostile environment and variety of actors also requires better training and equipment for the TCC countries from member states. Lastly, resilience is of the outmost importance. Attacks on MINUSMA have shown that especially Western TCCs are not willing or able to provide long-term commitment when troops are at risk. Without increasing resilience of TCCs, however, a mission in Syria cannot be successful. 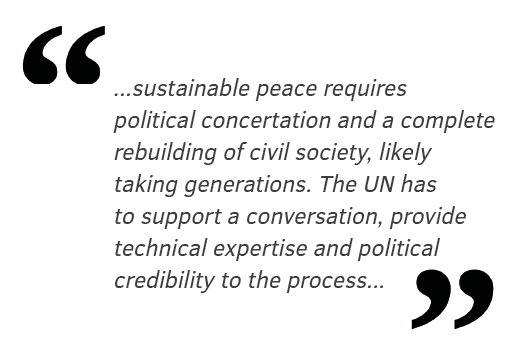 At the end of the day, sustainable peace requires political concertation and a complete rebuilding of civil society, likely taking generations. The UN has to support a conversation, provide technical expertise and political credibility to the process and foster coherence between both foreign and domestic actors. A potential peacekeeping mission in Syria would have to be hybrid and have a strong mandate which enables it to not only go after terrorist organisations but also ensure stabilisation of the country. In addition, there needs to be considerable political capital which fosters dialogue within Syrian society and, at the same time, limits the intrusion of external actors looking to further their own national interests. In a climate of budget cuts, paralysis at the Security Council and lack of commitment from the region, this seems like a very tall order. However, it is essential for the UN to prepare itself and, to the best of its ability, work towards the peaceful resolution of the Syrian conflict should it be asked to do so.